Despite the battle system giving more depth to its gameplay, Jurassic World: The Game is a building sim through and through. In this sense, resource management is pivotal for the continued success of the player, and their proficiency in this area can either make or break their progress. If you’re the type of player that is constantly getting stuck in this game, without enough food or DNA to help you get past the missions and challenges it offers, then odds are that there’s something you’re not doing right. 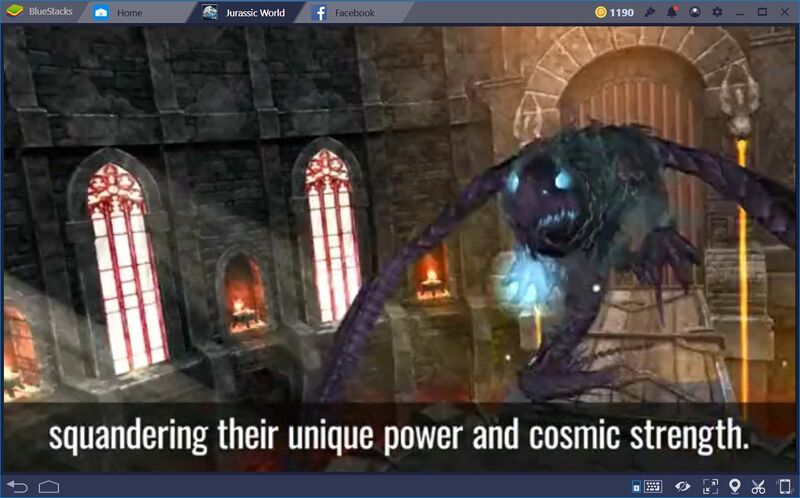 Of course, the vast majority of these obstacles can be avoided by simply throwing money at the game, which is what the developers always intend when creating these types of games. In this sense, this guide is meant for beginner and intermediate “free” players, who want to get good at the game and build a great park, but without having to dive into their own wallets to achieve this. Nevertheless, there will be a few tidbits here and there for those that want to invest a bit into the game, so that they can get the most bang for their buck. That being said, the very first thing you’ll want to consider if you want to invest in this game, is spending money on the Super Rare or Legendary packs, especially near the beginning of the game when they can help you the most and, most importantly, when they go on sale, which happens every so often. 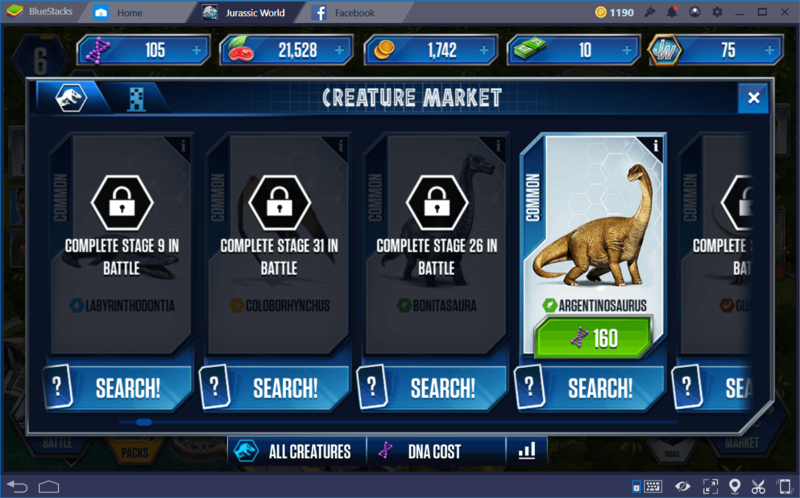 These packs often contain awesome dinosaurs, DNA, and Dino Bucks, which you can use to give you an edge over the competition. When it comes to these types of games, new structures and units are often unlocked through spending resources and advancing naturally through the game’s chapters and missions. In this sense, players will need to be patient when trying to unlock all the content that Jurassic World: The Game has to offer. Resources will always come in naturally with time, so there’s no need to rush to spend it all trying fruitlessly to purchase everything. In these games, fortune frequently favors the patient. You will likely have to face off against various players and complete many missions before being able to build the park of your dreams. 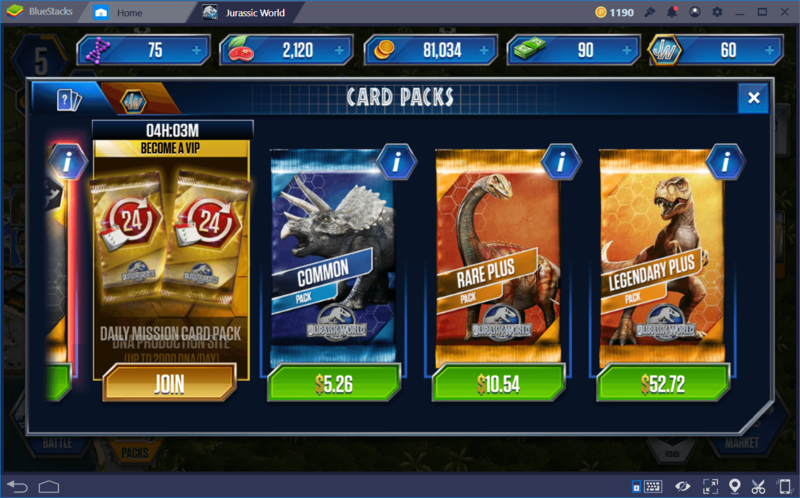 “Packs” are the game’s most frequent items that can be bought with Dino Bucks. They give players all sorts of advantages such as Dino Bucks, DNA, unlockable buildings, and awesome new dinosaurs to hatch in your park. However, all of these packs, with the exception of one type, must be purchased using real money from the in-game store. Nevertheless, there is a free pack that refreshes every 6 hours. 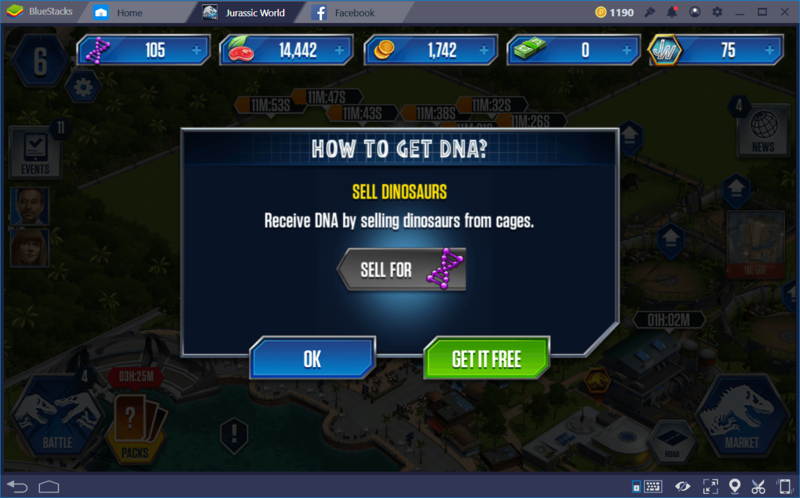 This free version can contain DNA, dinosaurs, and some timed-quests that can give great rewards when completed. Always make sure to check your game every 6 hours so that you can get at least 2 or 3 packs every day. Every once in a while, you will also be presented with some advertisement videos. We know that sitting through ads can be a pain. However, it’s worth to watch a few of these videos since they can give around 3 DNA per video watched. 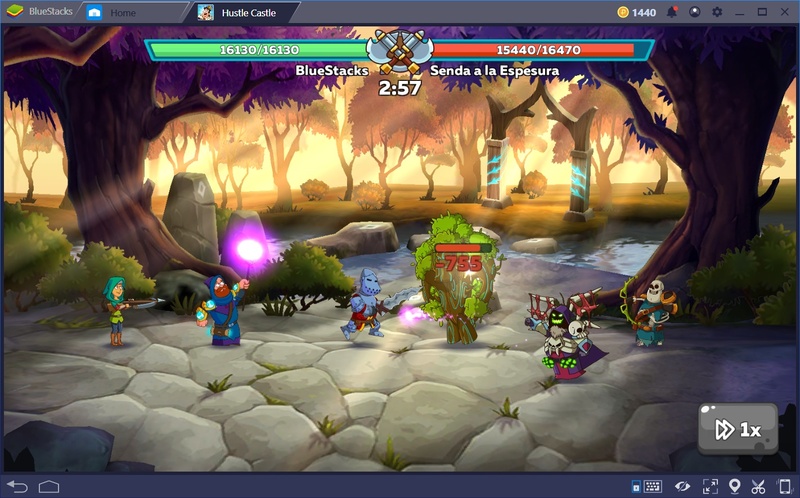 A good way to make this process go more smoothly with BlueStacks is by simply playing a video, and sending the emulator to the background while you do something else on your computer. Alternatively, you could also simply put on your favorite show on the TV to keep distracted while the advertisements play themselves, granting you plenty of DNA. Whenever you have downtime in the game, consider watching a few advertisement videos. Always keep your food production building working. 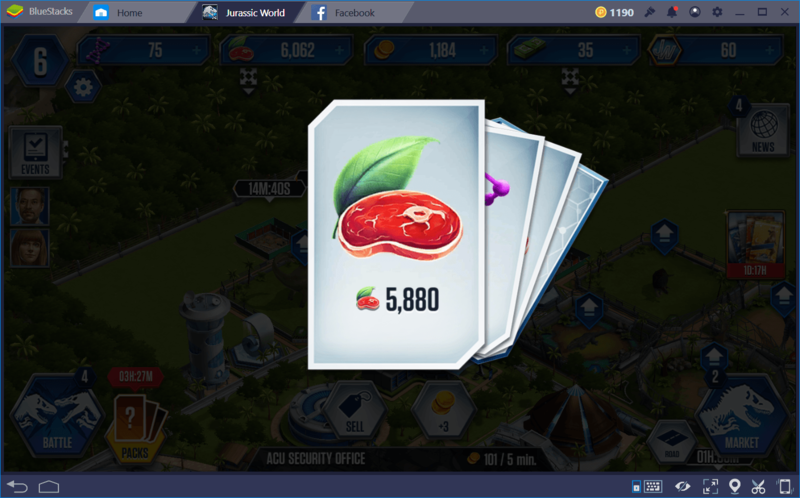 In Jurassic World: The Game, food doesn’t produce itself in your buildings, you need to manually assign them every time the building is done producing a batch. You can assign up to several batches at once by clicking several times on the production button, which will give you a bit of leeway so that you won’t have to check your screen every few minutes. Don’t go all out when it comes to investing resources. Always save some food and coins so that, every time a timed quest comes by, you can easily complete it for some easy dino bucks. To optimize your food production, always keep your building upgraded to its maximum level. You can upgrade it for the first time upon reaching level 5, and a second after reaching level 10, and so on. Starter gold buildings are the way to go for early-game coin management. Build at least 20 Security Offices and Jungle Bean Coffee Shops, and play diligently for an hour or so. Before long, you’ll have more than enough coins to advance pretty far into the game. That being said, always prioritize expanding your park, which you can do every time you level up by using coins. This is important because more space leads to more opportunities to build structures that produce more coins. Don’t immediately upgrade every single dino you get. Only invest food and DNA on those that you will be using in arena fights. 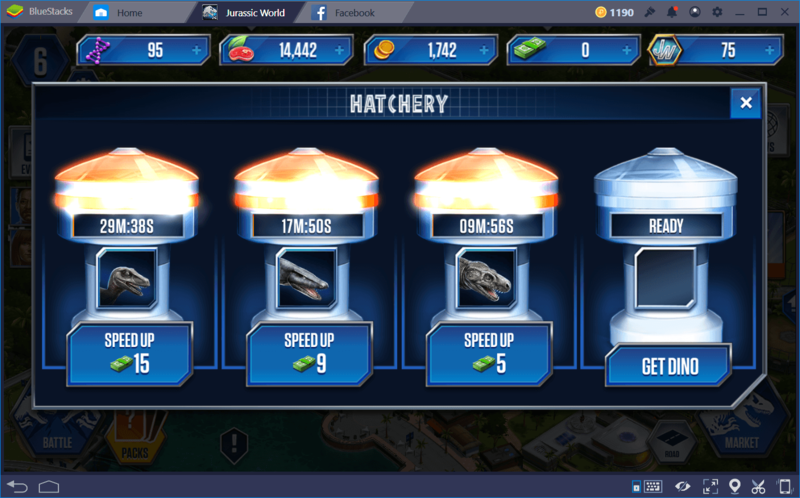 By upgrading dinos, you also increase the coins they generate per hour. However, using coin production buildings is a much better way to go about this task. Also, some timed-missions require you to spend a certain amount of food within a certain timeframe. By keeping some low-level dinos around, you can easily achieve this objective simply by dumping a bunch of food on them. We know it’s awesome to keep a strong roster of dinosaurs handy for bragging purposes. However, DNA should not be used lightly, as it is one of the hardest resources to produce in the game. 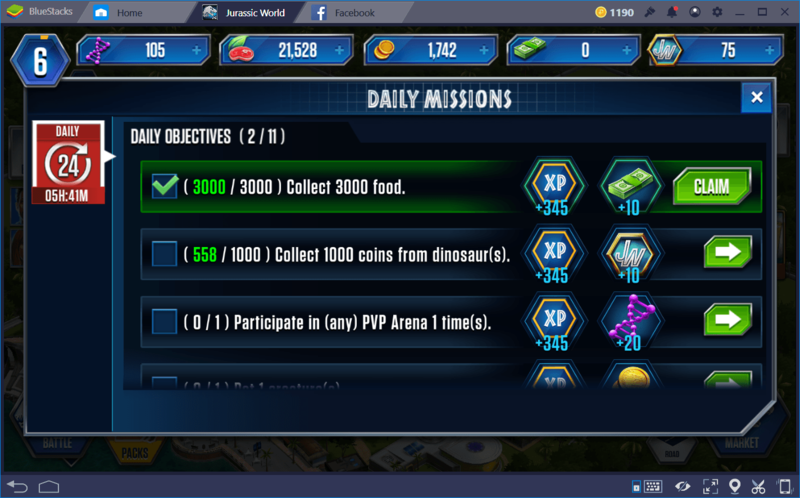 Limit yourself to upgrading dinos only when you’re stuck on missions and, even then, be sure to only spend on the dinos that you are using in your team. As you progress through the game, you will unlock specimens that require a lot of DNA to produce and, if you go about spending it willy-nilly, you won’t have enough for bigger and better creatures. 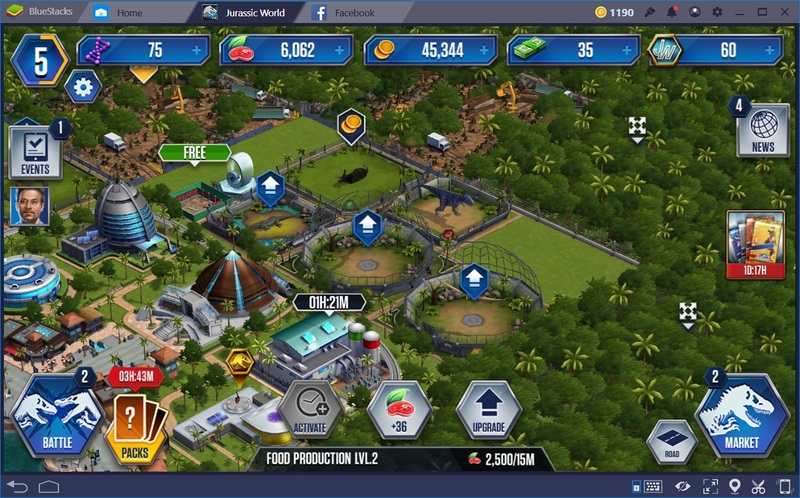 These are only a few tips that can be used by beginners or intermediate players, and that can give them the edge they need to advance further in Jurassic World: The Game, and build an awesome park. Do you have any other awesome tips you would like to share? Feel free to do so in the comments below!